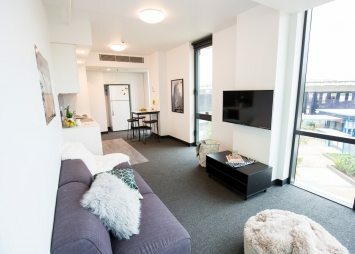 UniLodge Park Centralin Woolloongabba, Brisbane, has 2 types of 6 Bedroom Apartments student accommodation to choose from. Click one of the tiles below or scroll down the page for more information. FREE unlimited high speed Internet WiFi 100mbps. All bills included. Pay NOTHING extra on top of your weekly rent! 6-Bedroom Apartments in Park Central are ideal for six single occupants who want to live in a shared space. The apartment kitchens are fully-equipped with a refrigerator, cooktop, electric oven and microwave, and the living areas have a dining table and chair, lounge seating and a 40” LED SmartTV. There are three shared bathrooms in each apartment. Each of the six bedrooms have a King Single Bed frame and mattress as well as a study desk and chair. The rooms are secure, air-conditioned and full of light, and in close proximity to all major public transport links. Rooms shown during inspection are for display purposes only. Actual room allocation at the time of check in may have a slight variation of direction, shape or size. Very small percentage of rooms in Sky Tower may have non operable windows. For more information please click here. Rental rebate will be applied to your rent account and will be credited towards your first week of rent charge. You will be issued with laundry credits which can be used towards your wash and dry. This cannot be exchanged for cash or rent credit. Use the Hanaro Mart credit towards your daily grocery. This Asian Grocery store is located right on your door step at Metro Tower. Use it to go places with Uber Rides or explore your next culinary adventure with Uber Eats. Healthy eating just became easy. Use the credit and choose your favorite chef made delicious fresh meal delivered. You will also receive other free Youfoodz products and merchandise with this incentive. All in One Essentials Double perfect for your new home! Bed & Bath Essentials perfect for your new home! When we say “essentials”, we’re talking about the obvious need for bed and bath sheets. We’re not suggesting it’s essential to have soft and fluffy 100% cotton towels or top quality, hotel grade bed linen. It’s just very nice to have those little luxuries. Which is why our Bed & Bath Essentials Pack is now rather more plush – helping make your home feel even more like… home. Home Essentials perfect for your new home! So you’ve already got a few pots and pans, a chopping board and one of those veggie spiralizer things you’ll never use? Then the Home Essentials Pack is for you. It’s all the soft and fluffy luxury of 100% pure cotton towels and hotel grade linen – plus quality porcelain and glass dinnerware and a stainless steel cutlery set for two. Just don’t forget to pack your can opener! Bedroom Essentials perfect for your new home! As long as you’ve got a bed to sleep in, some things can just wait. You’re hardly going to be screaming out for a bath mat, cheese knife or sieve on your first night. That’s why our Bedroom Essentials Pack includes quality hotel grade bed linen, pillow cases and a quilt. Everything you need for a good night’s sleep…apart from your favourite teddy bear, of course. Bathroom Essentials perfect for your new home! Now we’re not going to get drawn into any argument as to what constitutes a bathroom “essential”. Some say a toothbrush and a towel is all you need; others would insist they can’t live without their cleansers, moisturizers, loofahs and jasmine-infused bath oils. So all we’ll say is this: it’s essential to have a bath towel, hand towel, face washer and bath mat – all made from high quality 100% cotton. Kitchen & Dinning Essentials perfect for your new home! Chances are, you’re not going to be the next celebrity chef. But even if you don’t sign a lucrative book deal any time soon, you’ll still need to try your hand at a few tasty recipes. So we’ve put together a great starter pack that provides everything you need to get creative in the kitchen. Bon Appétit! Dinning Essentials perfect for your new home! Unless you plan on spending your days in food courts, cafes and waiting for your Uber Eats to be delivered, you’re going to need some basic dinnerware and cutlery. this handy starter pack matches quality porcelain and glass dinnerware for two with stainless steel cutlery – perfect for those times you want to share your culinary creations with a friend! All in One Essentials King Single perfect for your new home!